The "creator" of giantology has posted in response to some people accusing him of being part of a viral marketing campaign for SOTC. This shows good planning and executing of this campaign: they acknowledge some people's opinions and claim not to know of them. Here is the email I sent to the blogger of giantology about a week ago. I posted a comment on your site, but I wanted to contact you directly. If you look at both videos, you will notice heiroglyphics on both of the "skeletons." These heiroglyphics can also be seen on the giants in the game. You can look at some screenshots at this site: http://www.gamersmark.com/screenshots/1243/ Seems like a little more than a coincidence, wouldn't you say? Both videos appear to be digitally altered. It appears they are a hoax, but who would go to such an effort and create films of this production value? How about someone that had access to a lot of money, say, a major electronics and videogame manufacturer like Sony? At this point, I am not quite convinced that you and your website are just another aspect of this campaign. It seems strange that you would be the first to have both of the videos on your site. If this is a viral marketing campaign, then it is quite an impressive one indeed. I'd like to know what your views on this are. I have yet to recieve a response. This could be because of the overwhelming amount of traffic the site has been recieving, or because they refuse to respond to this letter. I'm not leaning one way or the other yet, but the comment I posted on the giantology site has not yet been put up, when others have. Also, the backstory for the Siberian video has been elaborated upon. Apparently, the person that shot the video and made the "discovery" has gone into hiding. I seriously doubt this, but it is adding more to the story. Also, I read this comment on the giantology site that I found quite amusing. 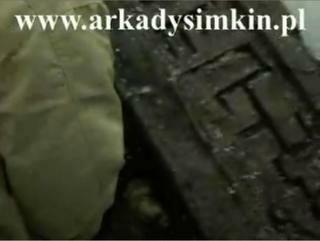 I came across your site and watched the video of the Russian giant. I think it is definetly a hoax. I speak Russian. How they speak sounds very scripted. At the beginning of the video you hear someone yell from off camera. He says, “I found something, it looks like some sort of animal.” Then they all come over and start chiseling at the ground. Clearly at this point it is not apparent what is in the snow or that there even is anything in the snow. Just the way they are speaking and the fact that they say they have found something before even really finding anything makes it seem scripted. 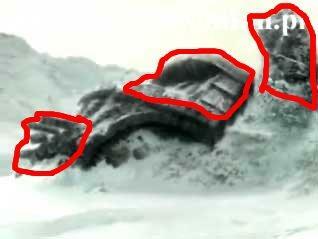 Also, the wide shot at the of the thing coming out of the snow looks very fake. Especially the piece on the left looks like it’s computer generated. Alright, now I will show similarities between both a) the two videos and b) the videos and the screenshots/trailers for Shadow of the Colossus (SOTC). Notice the similarities? Both show the same type of strange markings. The picture on the left is from the Siberia video. The one on the right is taken from a screenshot of SOTC. 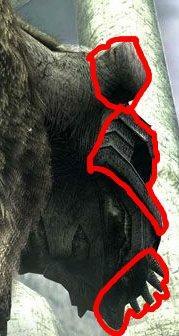 Both of the creature's heads share features: The "eyes" The horns, and the "beard" (what I'll be refering to the feature of jutting spikes as) This shows that this is in fact a viral marketing for SOTC. I would first like to tell you a little bit about this blog. This is (as of now) a blog dedicated to exposing a very well composed and executed viral marketing campaign. What is viral marketing? Here's a link to a wikipedia article about the subject. A few weeks ago, I saw a link to a video on kontraband.com to a supposed "Giant" found in India (click link for video) Right away, I suspected viral marketing as a possible explanation, but I needed the answers to this: what was this advertising? I knew for a successful viral, there were likely to be more than one video or website, etc. Then, yesterday, I saw this video. I knew there was a connection, but what? They were both found on the same website, www.giantology.net, which was watermarked on the first video. Both "skeletons" looked similar, and had similar carvings on them. Then I remembered a preview for a video game I had seen a while ago, Shadow of the Colossus. 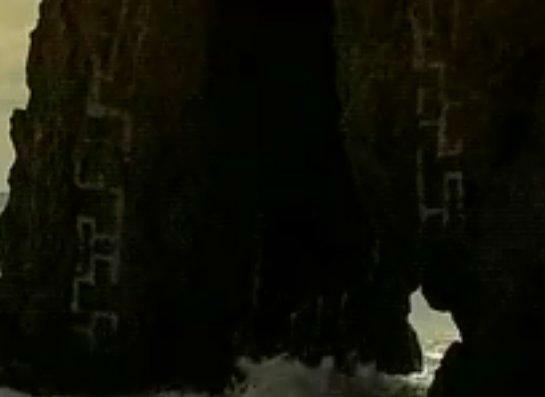 I looked into it, and the colossi in the game, and the giants in the video looked extremely similar. I now have evidence that shows a direct connection between the two, which I will present in different posts.